It’s been a looooong time since there has been a cocktail or glass of wine on this blog. Let this not be confused with the frequency that they are consumed. It’s just that, well, drinks are hard things to take a photo of and making drinks at home is…indulgent. When I saw that tarragon was theme for this week’s Root Source Challenge over at CookThink, it got the wheels turning about using it in a cocktail. I haven’t taken part in the RSC, which I was doing with some regularity before everything went topsy-turvy. Why not just go off the rails and try something new? A martini! Might not get another spare moment to take part for a while! Some people find tarragon to be a mild herb. I am not one of them. The slightly licorice-y taste must be something I am sensitive to because I always have to use it in small doses or overpower it with something else. For this drink, I chose the former. I made a simple syrup with some tarragon i finely chopped. You can strain the bitties out if you want but I prefer to see them in the drink. To compliment the herb flavor, I roughly pureed some fresh apricots. The mild fruit flavor took the edge off of the tarragon and imparted a delicate fruit flavor in the vodka. If you would rather not have a chunkier puree, strain it or use straight juice. Mango and peach would also be yummy in this! 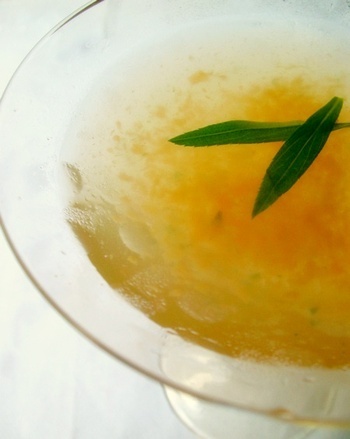 1/4 ounce tarragon simple syrup – bring equal parts sugar and water to a boil and add chopped tarragon – strain it if you want a completely clear simple syrup or keep the bits in for a cue to the tarragon. You can make as big a batch as you want – I used 1 cup water to 1 cup sugar and added 1/2 cup chopped tarragon. Shake in a martini shaker and strain into a chilled martini glass. Garnish with a tarragon sprig and enjoy. This recipe could also be used as a base for bellinis – just pour the apricot puree and simple syrup into a champagne flute and top with bubbly! What a cool name for a drink! so cool, so refreshing, so right..
you are my idol.. when I grow up I want to be just like you…..
My husband loves tarragon with a capital L. Maybe I shouldn’t show him this! Yum, that looks (and sounds) really delicious. I want to booze with you! This sounds so good! I love tarragon but I find it a bit over-powering too. For anyone named Tara, the TarraTini would be perfect! So cute. Nice idea. As a martini aficionado, I say “kudos to you” for a very original and tasty sounding drink. I will try this one. Can’t wait to try this tonight (er, this afternoon), Tami. I must say it looks pretty interesting, tempted to try it. Thanks for the apricot martini recipe – cant wait to try it!